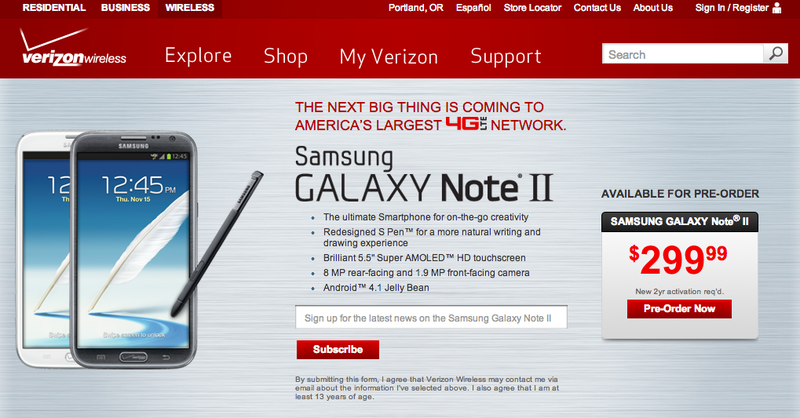 Well, it appears that for whatever reason, Verizon decided that it didn’t want to announce a pre-order for its version of the Galaxy Note 2. We say that because you can pre-order it this very minute through their website. Our sources mentioned to us a couple of times over the last few days that October 25 would be the day that pre-orders went live (which works because it’s midnight on the east coast), but we still expected to hear something official from Big Red. Whether or not we do is not important at this point. If the Note 2 is to be your next phone, then get your three Benjamins ready, and pop on over to pre-order. If you walk through the pre-order process, you’ll see a “ship by” date of November 27. You could see it sooner or later than that, but we won’t know for sure until we hear from Verizon.